Our portable photo booths are a unique way to capture the spirit of your wedding party or celebrations. No photographer is required thanks to the booths automated system which utilises state of the art photographic equipment with simple on screen user instruction. Guests enter the photo booth, position themselves accordingly and press the start button, after a short delay to compose yourself 4 photos are taken a few seconds apart, guests leave the photo booth and collect their print which is ready in just seconds. A perfect memento for your guests to take home from the event. 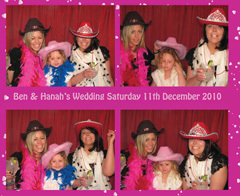 The photo booth is ideal for any celebration, party entertainment or especially a wedding. We can even customise the prints to include a special message from you, a specific colour scheme or graphics. All images taken are Royalty Free and will be uploaded to our website (Password protected) for any of your friends and family to view and print if they wish. You will also receive a DVD of all the images to enjoy copy or reprint at your leisure. Our popular 'Prop Box' filled with hats, wigs and associated props for your guests to create some truly imaginative photos comes as standard. 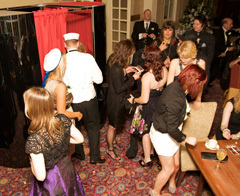 Our photo booths are available in a choice of different colour curtains white, pink, red or blue as standard. We can also provide different colour panels or customised branding for an additional cost. Complimentary DVD of all photos taken - Royalty free and available to print or copy at your leisure. Photos stored online – A convenient way to invite guests, friends & family to view the photos (Password Protected). Supplied with a friendly operator - who is in attendance for the duration of the hire and only too happy to assist your guests. 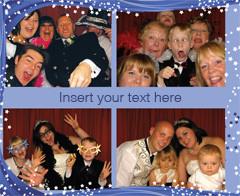 Photo booth Hire is also known Partybooth hire, portable booths, Wedding booth. Photo booth rental, mobile photo booth hire, groovy Booths, funky booths, Photographer Booths, Photography Booths. Ideal for Weddings entertainment hire, private parties, club nights, company parties, Christmas parties entertainment, Graduation Balls, School Proms, prom entertainment, Conference entertainment, promotions, promotional hire, exhibition attractions, corporate parties, party hire, event hire, fun hire, Product launches, corporate hospitality, themed events and entertainment, corporate event hire. Charity Balls and Fundraising nights The Photo booths are one of the best entertainment ideas, wedding ideas and party ideas.